Disillusionment. 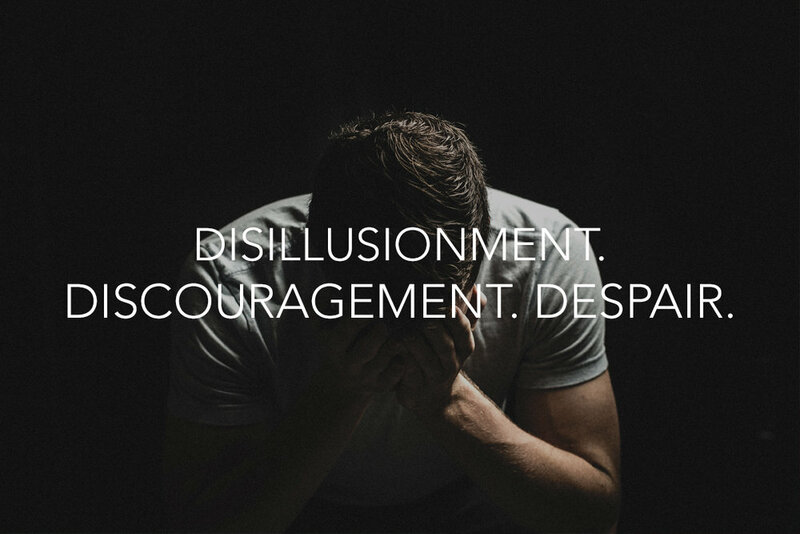 Discouragement. Despair. All three words have a few things in common. Like... they obviously all start with D. (That is interesting but not very important). Based upon what you read in Christian books and journals today, you may think most of us live with these powerful emotional words defining the nature of how we really feel in our private lives. For sure, we all experience seasons of darkness similar to Elijah, where for a brief period of his life faced extraordinary challenges resulting in anxiety and loneliness penetrating him to his core. But, I think for most leaders I connect to and including myself, these are seasons and do not permanently define our view of life, marriage, ministry or leadership. Sometimes I can develop a victim personality that blames others for their feelings. Other times, I say “no one understands the loneliness and stress of being a pastor, leader, etc.” In reality, I just need to accept that the three D’s are a normal part of being broken people living in a fallen world. However, if such feelings are dominating your heart and mind, and it has become far longer than a season, perhaps you need to talk with a good friend, counselor or leadership coach. Playing a victim will get you nowhere, but doing nothing will get you there faster.